2017 hasn't been as good as hoped for some big industrial stocks. Industrial stocks were supposed to have a big recovery in 2017, based on the potential for a stimulus bill and a global economy that seems to be on a steady growth path. But that hasn't happened at all, at least with some of them. In fact, March was a pretty bad month. 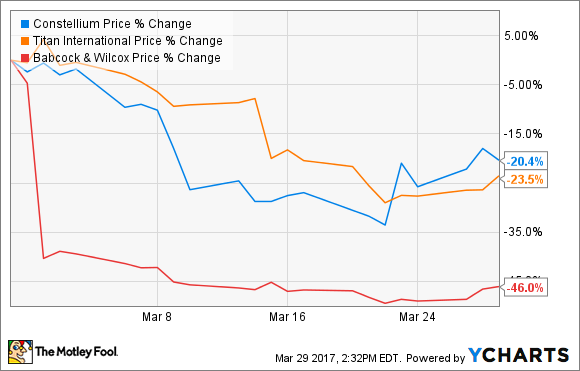 Babcock & Wilcox Enterprises Inc. (NYSE:BW), Constellium NV (NYSE:CSTM), and Titan International Inc. (NYSE:TWI) have struggled recently, and the macro environment and earnings have been a big driver. In simple terms, the growth that investors had hoped would arrive in mining, metals, and energy just hasn't been there so far in early 2017. Fourth-quarter 2016 results reported on Feb. 28 didn't do a lot to put a good spin on Babcock & Wilcox's future. Revenue fell 24.4% to $380.0 million and loss per share rose from $0.10 a year ago to $1.47. Adjusted earnings were even worse at a loss of $1.60 per share after pulling out a one-time non-cash gain, far below the $0.37 per share in profit that analysts expected. The power and renewable segments saw declines of 33.3% and 51.7%, respectively. Despite the bad numbers last quarter, management expects revenue to grow from $1.6 billion in 2016 to $1.8 billion in 2017 with adjusted earnings of $0.75 to $0.95 per share, down $0.60 from previous guidance. One of the biggest struggles right now is the renewable energy segment, which has been plagued by delays and poor execution. With losses piling up and guidance on the decline, Babcock & Wilcox may be in for a rough year unless renewable development picks up soon. The aluminum business has been extremely volatile over the last few years as investors' hopes and fears have come and go. Chinese suppliers increased production, which hurt earnings and sent metals stocks tumbling. But stocks would periodically recover as trade tariffs were proposed and implemented. However, the measures never quite worked out the way investors had hoped, and that came back to bite Constellium's shares in early 2017. One of the major factors driving shares lower recently was a disappointing fourth quarter. Shipments in the quarter were up slightly from a year ago, and revenue was up 3%, but the company still lost 20 million euros and posted a loss for the full year. A bullish sentiment for metals stocks after the U.S. presidential election has also quickly reversed course in the past month. While operations may have their struggles, this sentiment plays a big role in where Constellium's stock is trending in the short term. And if we see Chinese supply continue to weigh on the market in the long term, it could be a while until metals stocks have a sustainable recovery. The big-tire market was supposed to be in recovery mode in late 2017, but results didn't exactly turn out that way. Fourth-quarter 2016 revenue fell slightly from a year ago, and while net loss shrunk from $57.4 million to $14.1 million, the company didn't reach the breakeven point investors were hoping for. There are a number of factors that go into big-tire demand, but two factors are hurting Titan International's recovery: There's a lack of demand for mining equipment, and farmers are not yet replacing aging tires. Both trends can be cyclical, but investors were hoping they would turn in the company's favor in 2016, which didn't quite happen. However, management has done a good job of cutting costs where it can, setting up a lot of financial leverage for when demand does return. So, if predictions are right that we've reached a bottom in the market cycle and an upswing is coming, then there are positive signs ahead. We just don't know when that improvement will arrive, and right now, it's a lot later than investors had been pricing into the stock.